From Skelton Crew Studio. Get a little Hopeless. 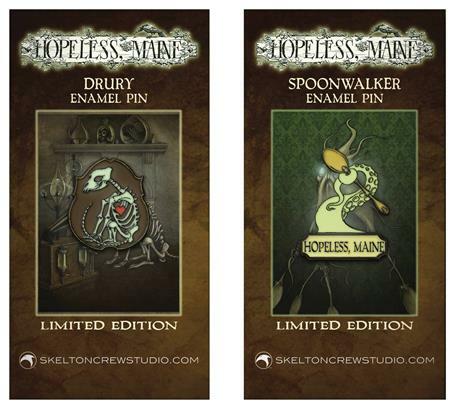 The Limited Edition Dury and Spoonwalker soft enamel pins are straight out of the pages of Tom and Nimue Brown's eerie, gorgeous Hopeless, Maine, published by Sloth Publishing. These officially licensed pins are approx. 1.25-inches tall. The Drury's bones and the Spoonwalker's tentacle both glow in the dark. Both come attached to custom backboards with two pinbacks with rubber stops each so your Drury and Spoonwalker are never caught upside down.